They just keep coming, and neither rain, nor snow, nor dark of night will stay these squash from their appointed growing. The familiar refrain rang through my head as I gathered up yet another armload of zucchini, which after a season, wears even the strongest gardener down. Every morning, there’s one that formed overnight; in the evenings you collect a few that escaped your attention earlier. 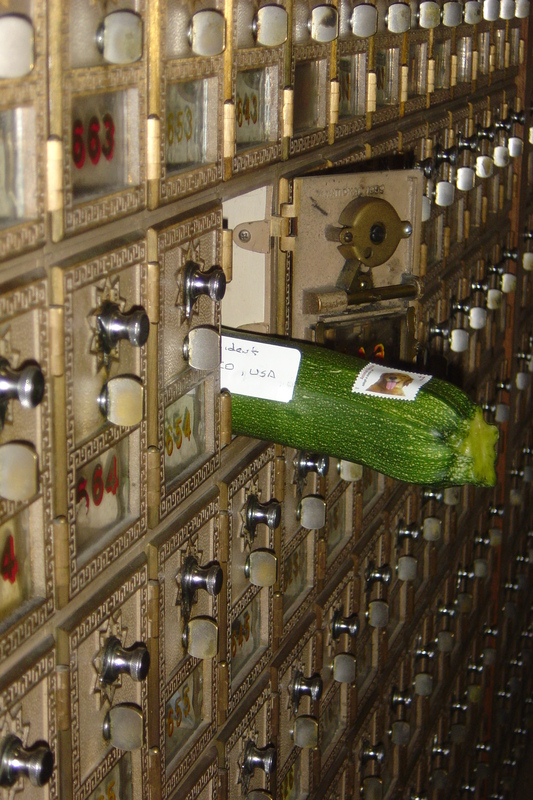 It’s no joke that you run out of people to give them to; even food banks plead for food other than zucchini. So the creative gardener turns to less traditional methods to divest themselves of squash. “Is there anyone at work you could give zucchini to?” I asked my spouse, casting a significant glance at the stacked mound of green cylinders on the counter. Working at a post office, I figured he’d find someone who hasn’t become sick of them yet. 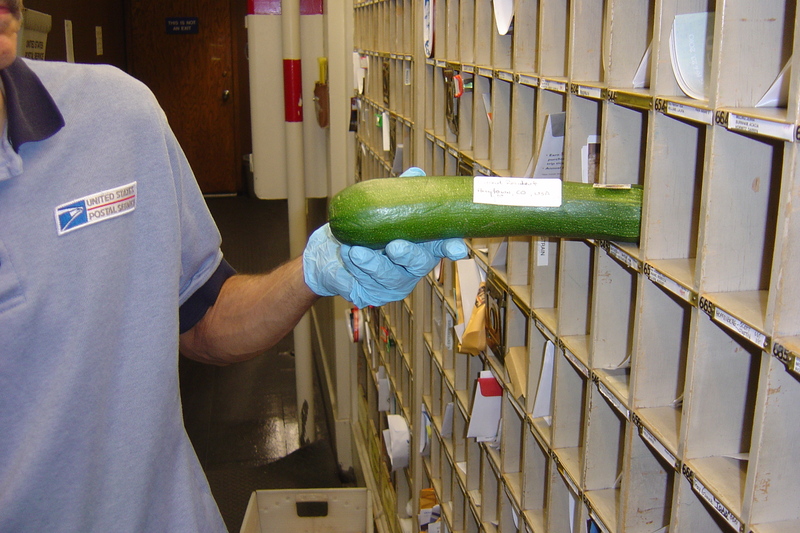 “I don’t think so,” he said, “I can’t just ask people if they need any stamps, package insurance, or a squash. And besides, everything has to have a stamp on it.” Disappointed, we stared at the future of our dinners for the next month. In the morning he set off, a sack of squash in one hand, a pocketful of change for stamps in the other, to work the miracle of modern shipping. I don’t know if the special deliveries were met with joy; when the bag came home empty I asked no questions. Why do we love zucchini at season’s start but loathe it at the end? True, it could be that we’re overloaded with it when it becomes part of our every day diet. There are only so many quiches, casseroles, steamed dishes, breads, and cakes you can tolerate. But there is also an interloper in the garden, a fungus that robs the plant of flavor: powdery mildew. Coating the leaves with a fine, white dust, powdery mildew sets in on squash plants late in summer, living off the sugars the plant produces. Once it takes over, the quality of the squash suffers and it’s not as enjoyable. Little can be done to combat the disease, other than sowing seeds weeks apart to keep young plants on hand (but prolonging the zucchini season isn’t something experienced gardeners do unless they’re looking forward to a restful stay at a rehab center). Live with the disease, and when the squash stacks up, think creatively. I have a new pile on hand, so when the doorbell rang and I glanced up to see a salesman standing there, I smiled. Picking up the squash, I answered the door, stretching out my arm as if for a handshake. His stunned expression upon being zucchinied was worth it – I’ll grow more squash next year. Many thanks to the United States Postal Service for their sense of humor in aiding with this story. This post was previously published in the Longmont Ledger. Who says fruits and vegetables are just for dogs? 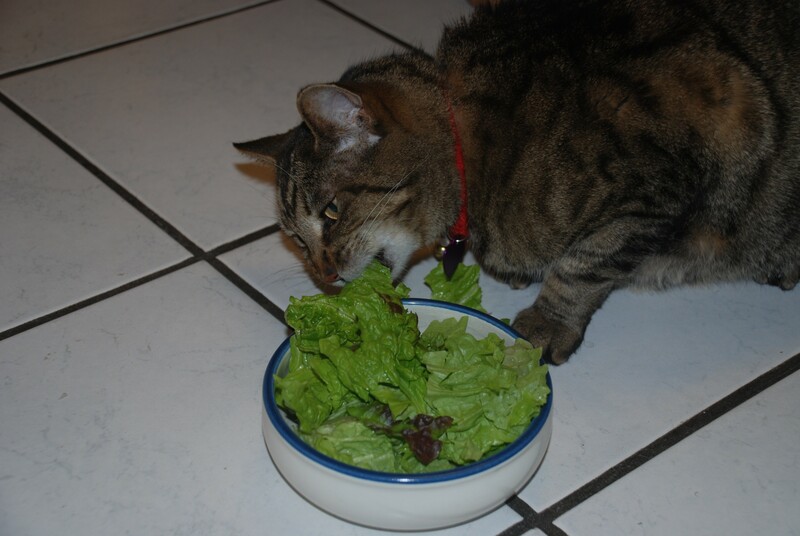 Merrill shared this about her feline companion: “My cat, Hiram, loves salad more than anything thing in the world. When he hears the produce drawer in the fridge open, he runs in for some lettuce, tomato, zucchini, etc.” Hiram is no fool – he’s figured out that he doesn’t actually have to get out and harvest anything. 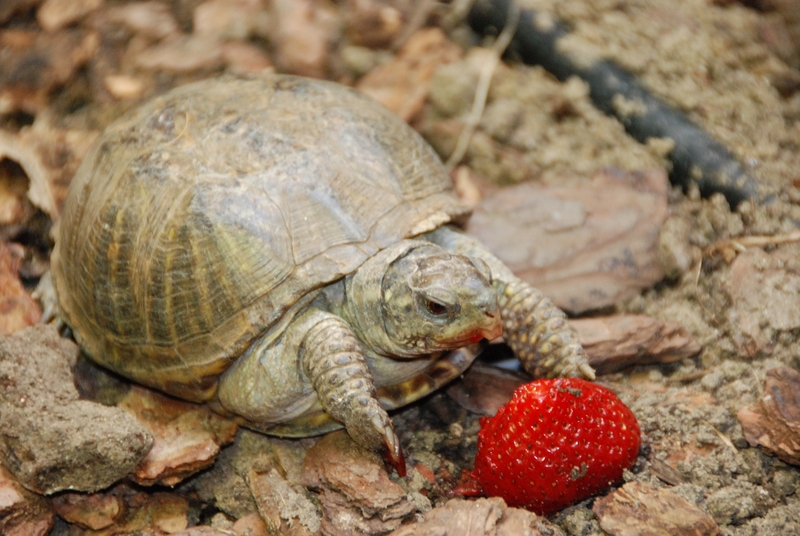 Turtles love a fruit snack, as two staffers (Amy and Audra) in my office pointed out to me. Here’s Lila, her beak and feet red from strawberry juice. When they got home from the party, Alison and Gil O’Connor noticed something was wrong. The potted tomatoes were toppled over, strewn about as if a microburst had hit the patio. But nothing else looked wind-tossed and, puzzled, they glanced at their eight-year old. Her face told the whole story. Willow’s smiling mug was green; her younger brother couldn’t keep the guilt from his eyes. Gazing at her eyebrows, yellow with pollen, the O’Connors knew that while they were out, their tomatoes had been burgled by beagles. 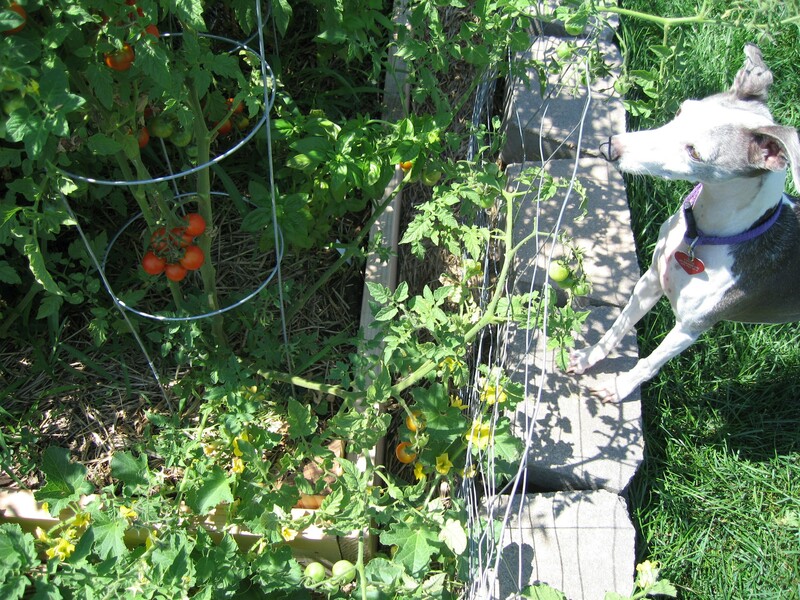 The pilfering pooches, Willow and Linden, aren’t alone in their love of garden fresh produce. Ask around and you’re sure to find dogs who like to super size their kibbles with vegetables. 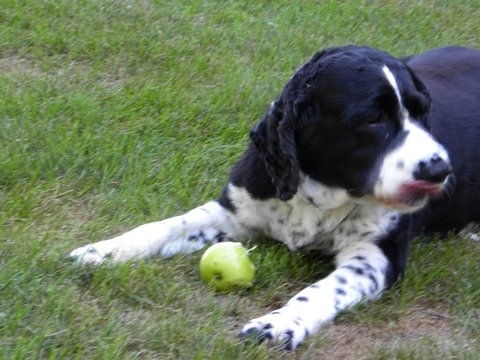 Ruch-Gallie’s own dog snitches a few treats, snacking on gooseberries in her mother’s garden. As long as it’s not avocados, currants, grapes, raisins, or brassicas (broccoli, cabbage, etc. ), dogs can eat what they like. For some, that means their human has to cook it for them. “My first clue that Dar liked butternut squash was when he sat facing the pan of cooked squash after I brought it out of the oven,” says Sukey Williams, speaking of her bronze-colored Vizsla. “He wouldn’t leave it and kept looking at me to make sure I saw his interest in it.” Sitting pretty, Dar convinced Williams to give him a taste, and from there it was love at first bite. Dar enjoys squash, skin and all, in every meal possible, licking the bowl clean when he gets it and pouting when he doesn’t. Williams chops the skin into the squash to aid Dar’s digestion. “It’s a reasonable source of fiber, which their gut likes. It’s soluble and good for them,” says Ruch-Gallie. “But make sure they have a balanced diet, or it throws their system off.” To avoid doggie digestive disorders, be sure the produce they get is never more than 5 to 10-percent of their daily food. 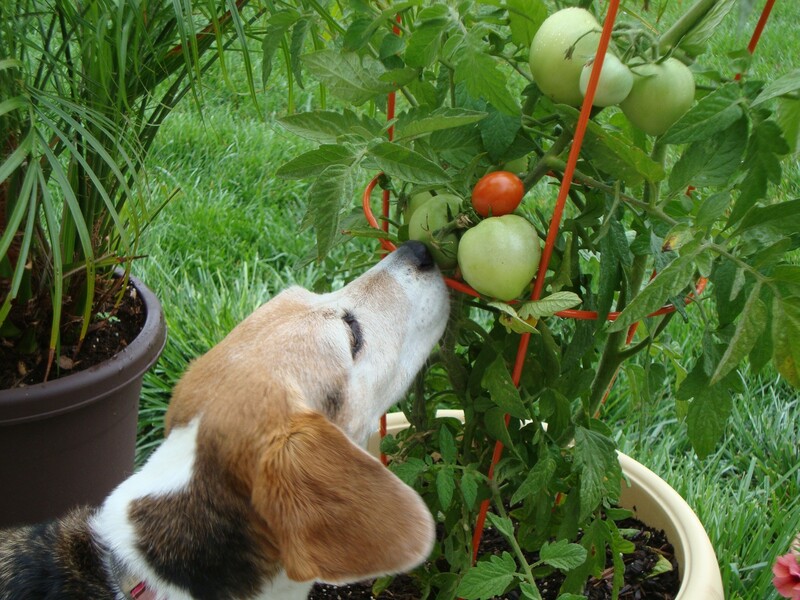 Gardens aren’t the only place dogs learn to eat vegetables; often they learn it from us. 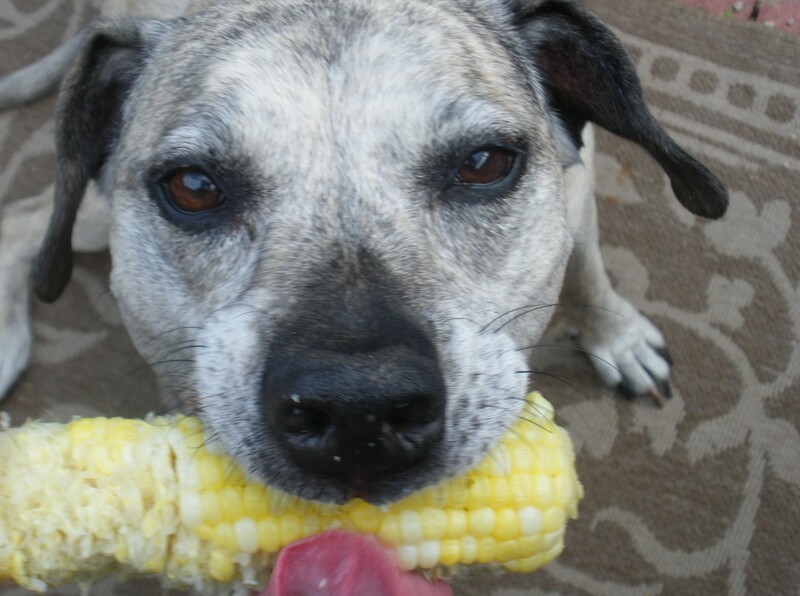 Zoe, a silver and white mixed breed, enjoys corn on the cob whenever her family cooks it. “She chews it right off the corn in rows, just like people do. When she sees that you’re cooking corn, see starts whining,” says Carrie Shimada. Nibbling the ears with gusto, Zoe cleans every kernel from the cob. 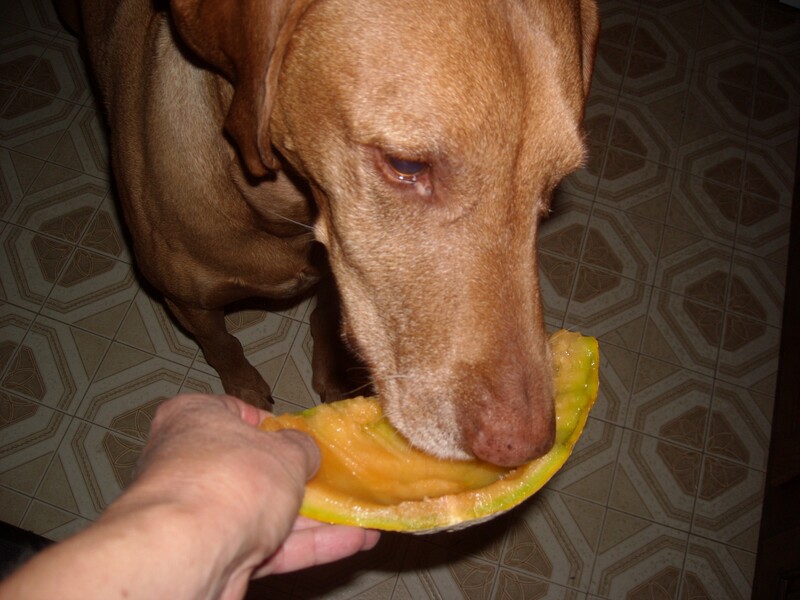 Send me a picture of your pet enjoying fruits and vegetables – I’ll post it here for everyone to enjoy. 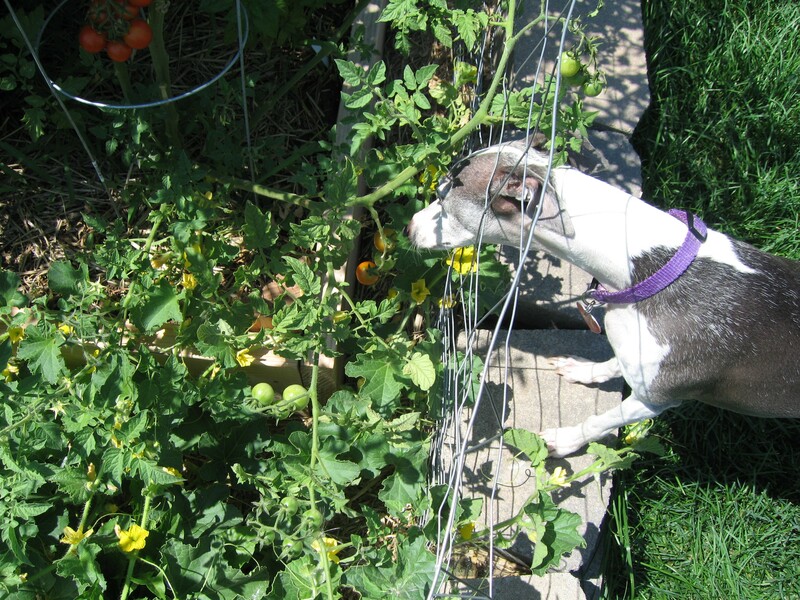 Vivienne sent in photos of her Italian Greyhound, who loves to nosh on the vegetable garden. Here he is, at first fussing over not being able to get to the fenced off goodies, then taking matters into his paws by pushing past the obstacle. In July we quietly suffered, patrolling the plants for the first signs of blush. As early August came and went, we paced the rows morning and evening, hoping for color in the green mass. By mid August, rumors of those who got a harvest began to swirl, whispered like Big Foot sightings or UFO encounters. But now the truth is out there, in the garden and on the vine. Yes, folks, tomatoes have finally begun to ripen. This year along the Front Range tomatoes are slow to mature, leaving gardeners scratching their heads and wondering if they’ve done something wrong. Though the fruit was plenty, those green tomatoes just sat there, tantalizing us with promise but refusing to ripen. Why do I consider the tomato the difficult diva of the garden? Aside from the hornworms, blossom end rot, spotted wilt virus, early blight, and Psyllids, the plant’s response to weather can drive you nuts. And that’s what many experts believe is going on with our love apples. This season began with soil temperatures staying chill well into June. Unless your plants were tucked in with plastic mulch, the cool soil kept growth steady but slow until the soaring heat set in at June’s end. But despite the sweltering days our nights stayed cool; temperatures dropped into the high 50’s and recently went lower. The nightly cool down slowed tomato plants, delaying the ripening of fruit until every gardener in the area lost their self confidence. Friends began reaching out for reassurance, texting and emailing their fantasies of filling their mouths with sweet, tangy tomatoes, begging to know what’s happening. Even I succumbed, sidling up to buddies to ask, casually, if they’d gotten any ripe tomatoes yet. “You neither?” They said in response, after which we felt better for the shared torment. …rain. And not just a little storm either; we had a mighty downpour yesterday, followed by a steady, soil drenching night. Don’t get me wrong – I love rain, and miss it more than I care to admit. But when it arrives just as tomatoes have begun to ripen, known as the breaker stage, the sudden influx of water can cause those love apples to crack. This is different than catfacing, which are indentations on the blossom end of the fruit caused, in part, by temperatures dropping into the 50’s during fruit set. 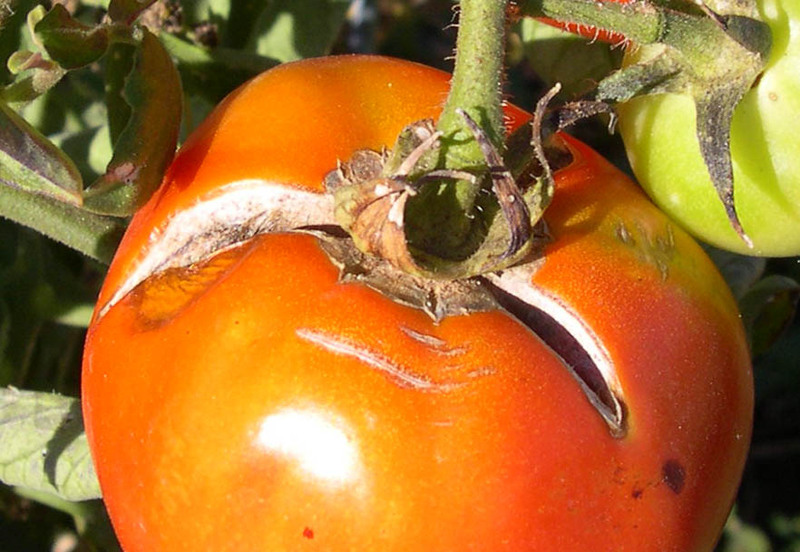 In advance of ripening the skin cells of tomatoes harden, leaving it unable to stretch if they get a sudden burst of water and resulting in concentric and radial cracking on the stem end. Concentric cracking are rings circling the stem, while radial cracking are splits that run from the stem down towards the bottom of the fruit. 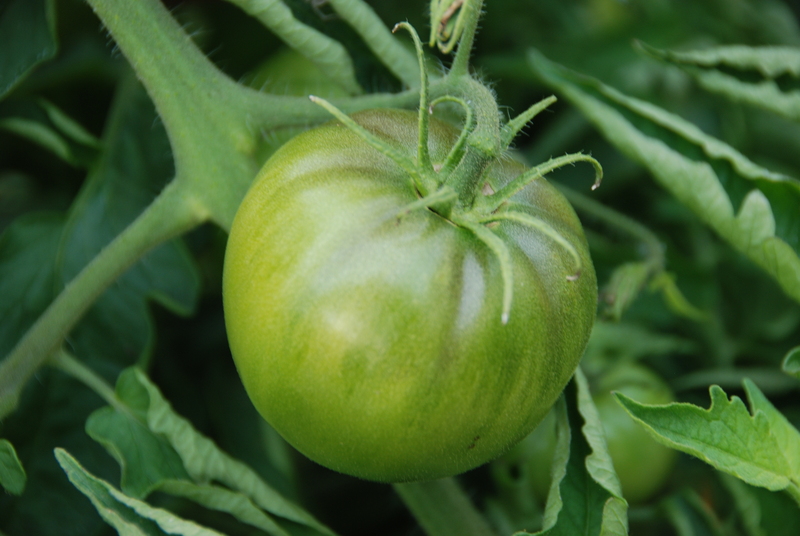 Some tomatoes are prone to this, others a bit more tolerant, with certain cultivars doing this in the green stage. Like most of the quirks of a difficult diva, ignore the cracks from the rain; there isn’t a lot you can do about it. Cut off the damaged area, slice up the rest and enjoy. Some of today’s hottest movies and television shows feature blood sucking creatures out of myth. Vampires roam through this current pop culture craze, lulling us into thinking they’re harmless, even beautiful creatures that are woefully misunderstood (“they’re sparkling!” my son – a monster purist – moaned in outrage). If you were a plant, you’d know the dark truth: blood sucking creatures do exist, feeding off the life source of ill fated victims. Dodder and mistletoe stalk the stems of our foliaged friends, and if you don’t come to their rescue, your plants will succumb. Often called strangleweed, devil’s-guts, and hellbine, dodder (Cuscuta and Grammica spp.) is a parasitic plant that lives off the chlorophyll of others, such as chrysanthemums, dahlias, trumpet-vines, and petunias. As a seed, it’s harmless and unassuming, lying in wait for a host to take root nearby. Upon germinating, the seedling gropes about until it touches its victim, then quickly clutches it in a deadly embrace. Snuggling up to its chosen host, dodder checks to see if it has the right chemistry and if the prey “tastes” right, dodder implants itself into the host with haustoria. Through these root-like extensions, the hellbine feeds, drawing water and food from the hapless plant. 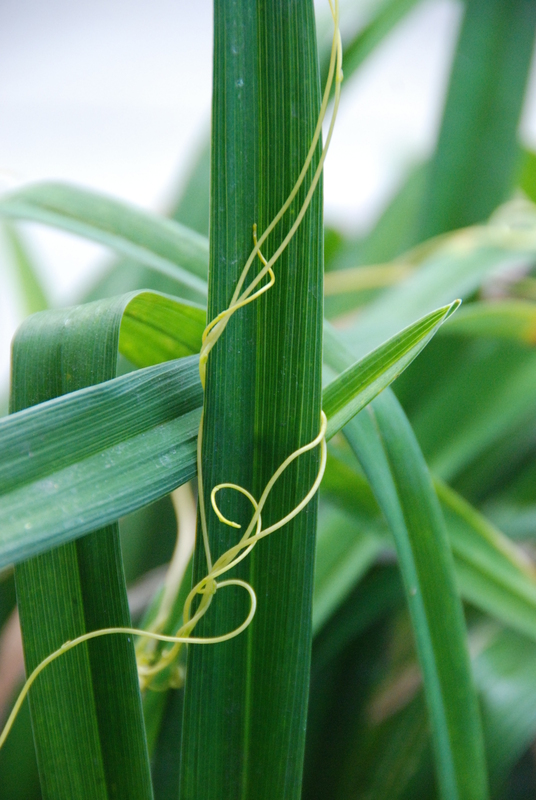 When implantation is complete, dodder continues to vine up and over the victim, letting go of its connection to the soil below. Though it doesn’t have the public relations power of its holiday cousin, dwarf mistletoe (Arceuthobium spp.) is a well-known parasite in Colorado forests. Like dodder, these leafless plants lives off those we love by colonizing Douglas fir and ponderosa, limber, pinyon and lodgepole pines. Implanting itself into the trees with “sinkers,” dwarf mistletoe slowly drains the life out of its host (something my son can relate to, having endured this summer’s popular vampire romance movie to please his date). Look for the yellow- or brown-green segmented shoots rising from infested branches. To please those who feel dread creatures just need a little understanding, let’s look on the bright side of these parasites. Dodder is a pretty little plant with slender, delicate stems of yellow or orange (occasionally they’re blushed a trifle red, but ignore that – it isn’t blood). Though it has no leaves, it does flower, wreathing itself in pinks, whites, and yellow to disguise the fact that it’s producing new spawn from seed. And dwarf mistletoe has one trick that’s a sure crowd pleaser: it spreads its seeds by canon fire. Blasted from their fruit at near 60 mph, the young splatter the forest in a gluey mass, sticking to anything they hit: branches, birds, or hikers. If it happens to be a suitable host, the seeds germinate and begin to feed. Watch for this phenomenon in August and September. Drive a stake through the parasite if you’d like, but control for either really relies on removal. Prune off infested tree branches or pull and destroy dodder infested plants. This post was previously published in the Longmont Ledger. 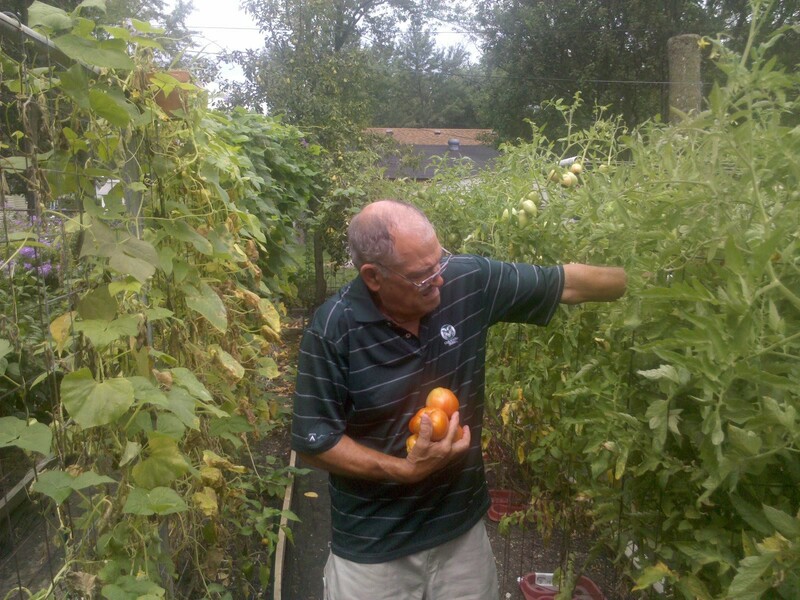 Earlier this season I posted a story of Jim Koski, the 74-year old gardener in Lockport, Illinois. Jim, through a method of early seed starting, salt paper wraps and soil warming, settled his plants in the ground a full month before we would ever dream of doing so. Dear heavens it looks like those plants are big enough to eat Jim alive! With nine-foot-tall beans and eight-foot-tall tomatoes, Jim is setting the bar high for gardeners across the USA. Rumor has it the peppers are the size of Buicks. A typical day’s harvest is 10 tomatoes, something I can only achieve in my dreams. Yes, it helps to have rain, and Illinois has had its share this year. One recent storm dumped seven inches in one day on the Chicago area. I’m lucky to get seven drops at my house. And true, Jim has what we like to call soil – rich, crumbly, and home to the flora and fauna that makes roots happy. At my place, the soil is what experts describe as “adobe brick”. But what really makes the difference for Jim is fish fertilizer which, given the amount of rain, might help those plants sprout gills and swim away. I’m impressed, and a tad jealous of the super-sized garden. I think I’ll go home and give my plants a good pep talk. Good job, Jim!